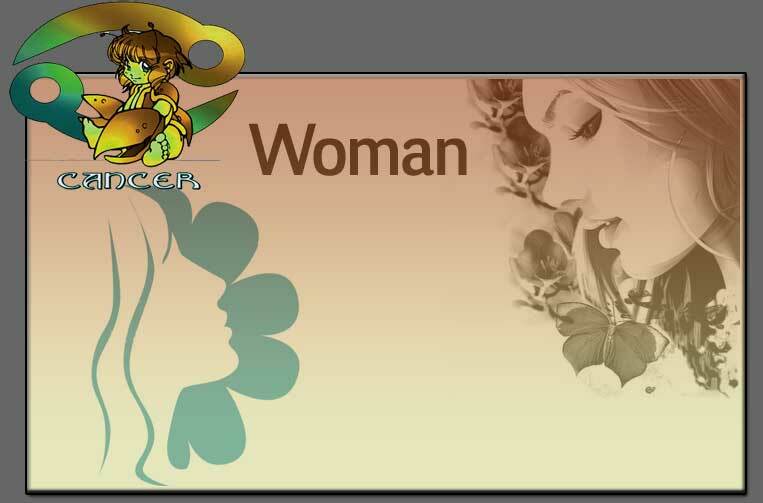 Cancer, Cancer woman- Understand about yourself. A Cancerian woman is an ardent lover of her family and the family members and does the best to keep them happy. They lack physical or emotional strength. When it comes to love she is highly expressive and emotional. It is very difficult to judge Cancerian women for sometimes they are fearful and hesitant and at other times seem to be vicissitudes with self-possession. They are very happy to be a home maker rather than for going jobs. They are instantaneously apprehended and remain emotionally attached to the partners and family members and look forward for the same from them.Cancerian woman manifest a desire to control or dominate another, especially in order to limit that person's relationships with others. But when they are neglected they submit to silence or give in and take a long time for them to come out of this disheartened feeling. They often get envisaged into the world of fantasy. They always look back to a happy time in the past and get swayed by sentiments. Being an emotional and expressive character they are good at writing poems and they can be a good orator or teachers.